Our MAX (Magnus Akira Xavier) has been mommy's little helper in the kitchen ever since he was old enough to imitate simple tasks. From mixing cookie dough, scooping ingredients (even when it's not called for, which keeps us on our toes), wiping flour on mommy's clothes and attempting to flip the bacon (extremely supervised), our little boy simply loves to "cook". We've bought him a "cooking" toy or two, but nothing beats the call of the REAL kitchen as far as MAX is concerned. I remember waking up early to fix breakfast for my hungry boy band (4 sons and Papa Phee) while setting the table and cleaning up a bit (multi-tasking at it's finest). MAX has always been one to want to see what's cooking, so I normally keep him at a safe, yet view friendly distance. But this morning, as I turned my back away from the stove to get some eggs from the fridge, MAX hurriedly went down from his perch, got my spatula and positioned himself on the stepping stool (reserved for our 4'11 helper who was on leave), and attempted to imitate my bacon flipping skills. Papa Phee was around to document the whole thing (the cellphone was the nearest camera), right before we slowly moved him away from stove. Since then, MAX has moved on to checking the oven (after we tell him it's safe to do so) while waiting for some homemade pizza or lasagna and occasionally putting things that need to be washed in the sink. He is changing before my eyes but his skin is still like a baby’s. 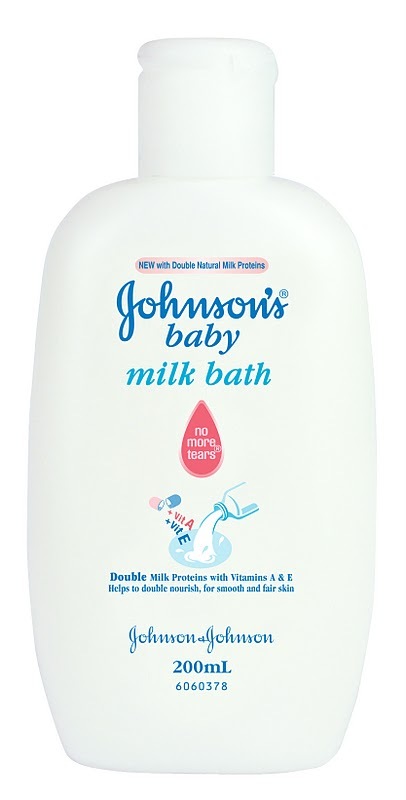 We still need the gentle care of JOHNSON’s Baby Milk Bath, with Vitamins A&E and 100% more milk proteins to nourish developing skin. Nothing but the best for MAX, and that's nothing but JOHNSON's Baby Milk Bath. After a messy time helping me cook or a relaxing bath before bedtime, this is number one on MAX and mommy's must-have list. The whole blog community can get involved! Comment on a blogger’s post by giving your caption suggestion for their photo entry. The more creative and relevant, the bigger your chances of winning a Johnson’s Baby Milk Bath gift pack from the blogger! Like the JOHNSON’s Baby World of Firsts Facebook page to make your comment valid. COMMENT ON THE BLOG ENTRIES TO WIN A JOHNSON'S BABY GIFT PACK! 1. Like Johnson's Baby World of First Facebook page. 2. Comment by giving your own title to the first photo. The more creative and relevant the title-comment, the bigger chances of winning. Note: Only comments from October 8 to October 21, 2011 are valid to win the gift pack. Please take note that comments SHOULD be done on the blog post's page not on the Facebook wall. Thanks! My caption for your little iron chef: "The next Wolfgang Puck in the making!" Caption: "MAX-sarap Ang Cooking Ko!!!" "Ooops! 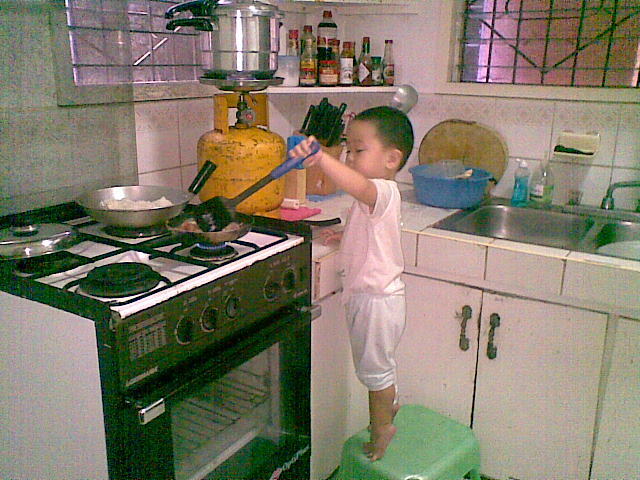 Mommy, I'm already tipping toes to reach the pan!" eto naman sakin, I hope you could drop a comment too. "Don't worry Mom, just watch me, I can flip this like an expert!" "stay put mom, i can handle it!" "Chef Gordon Ramsay, you better open up another restaurant! You're future Master Chef is here!" "Iron Chef is for the ninnies! I am mom's Iron Chef in every way!" IRON CHEF MAX: The smart chef has kitchen smarts! "Max the Master Chef: Replaced Jamie Oliver"
Hello Mommy! Thanks so much for joining! Tomorrow's the last day to comment. Please remind your readers to comment on your entry if they haven't commented yet. Only comments entered from Oct. 8 to Oct. 21 will be considered valid for the reader giveaway.